There are a number of books on Chito’s shelf, and they appear to be real books. Some of them are fairly obscure, though. In particular, we have センツアマニ, which as far as I can tell is supposed to be ‘Senzamani’? A cursory glance through the Japanese and Russian internets, neither of which I understand, seems to indicate that it was originally written by Maxim Gorky, and translated by Mori Ogai. Something about Familie Ohnehand? Honestly, I don’t know what’s up. If any of you happen to be Japanese Gorky scholars, let me know. There’s also カズイスチカ (‘Casuistica’), also by Mori Ogai (or translated by him?). Tettou no Kaijin by Edogawa Ranpo, that one at least is straightforward. Glancing at the rest of the shelf, there’s an うみのかなた and a もしか. I don’t know whether those refer to real works. I assume they do, but I don’t know what they are. Not that it’s terribly important, anyway. Certainly these don’t have the kind of weight that Akutagawa’s Kappa, as seen in Episode 2, bears. In Episode 7, there’s potato flour. This is less context and just a spot of interest about translation, and some of the decisions that get made. In any case, the word used in Japanese (and the kanji printed on the warehouses) is 粉. This could mean ‘powder’, or it could mean ‘flour’, the latter both in tandem with something else (小麦粉, ‘wheat flour’) or just by itself, when the context is obvious. So the question here is whether I translate this as ‘flour’ or as ‘powder’. And that question is a question of whether Chito and Yuuri know what flour is. If this were Yama no Susume, for example, there’d be no question. But with SSR’s setting, a bit of care needs to be expended on minimizing what we assume Chito and Yuuri have seen. Episode 5’s 二段ベッド (later recalled in Episode 6), for example, would have been ‘bunkbed’ in any run-of-the-mill slice of cute girl life, but in this context it’s ‘bed with two levels’. Ultimately we find out that Chito and Yuuri have baked before, and so I took that as license enough to use ‘flour’ (thank goodness, too, as it’s much more natural). 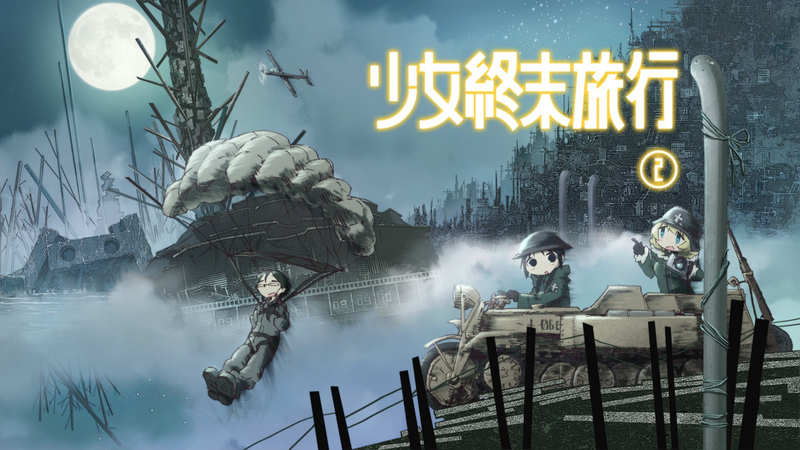 While Chito and Yuuri are climbing the spiral in Episode 8, Yuuri asks something like ‘Can one live afraid to die? !’, and Chito refers to it as a 名言 (めいげん), roughly meaning ‘proverb’ (lit. ‘famous saying’). She later clarifies that she means not 名言 but 迷言 (also read めいげん) by specifying 迷う (read まよう, but the kanji having an onyomi of めい), suggesting that the statement is stupid instead of wise (迷 roughly bearing the meaning of ‘misguided’, or ‘lost’). I went for ‘incredible’ along those circumstances, which, well, nobody uses the ‘not credible’ meaning anymore, but it’s something. Finally, a note about Short 8. This is in fact more heavily linked to Episode 10, so if you’re weird about spoilers, don’t read this. In the short they bring up ラジオ体操, ‘radio calisthenics’. Of course, everybody knows what these are. The major issue here is that they do use the word ラジオ, which is a big issue. In Episode 10, radio waves are referred to as 電波, the native Japanese term. 電波 is really more like ‘electromagnetic wave’ (lit. ‘electric wave’), but it’s very associated with radio in particular. The other thing is that the title of Episode 10 is 波長 (‘wavelength’), and there’s a long discussion that brings up all of 電波 (‘radio waves’), 音波 (‘sound waves’), and even light being 波の仲間 (‘related to waves’). Obviously, I have to translate 電波 as ‘radio waves’, and I can’t get away with something like ‘signal’ or ‘transmission’, which might have been workable in other circumstances. The wave theme is just too important, and ‘electromagnetic waves’ is dumb. So I have to use ‘radio’ to translate 電波. Then how do I translate ラジオ? Complicating matters is that it’s not clear whether Chito and Yuuri know what ラジオ actually means (it’s clear, in contrast, that at least Yuuri knows of 電波) or if they’re just reading it. Ultimately it was unworkable, and I gave priority to the main episode script (else something like ‘transmission’, losing the whole theme). Then ラジオ体操 ends up as just ‘radio calisthenics’, and the confusion is sourced not from what the word ラジオ means but rather from what it means for calisthenics to be modified by ‘radio’. That’s the cover story, anyway, and this in contrast to them not knowing the word ラジオ at all, and from there stemming their unsurety. Does it matter? No, not really. And it’s a lot of words about a decision that ended up being the same as the sort of unexamined default option. But I thought about it. Oh, and MORE ONE NIGHT. Hold on tight ‘cause right now our last tour’s starting up! Would it be alright if I stayed here by your side? You can listen to a guy reading the entirety of that Gorky story (the Russian title is “Ночью” or “At Night,” while “Familie Ohnehand” is the title of the German translation; it’s never been translated to English) in its Japanese translation (which is supposed to be a pretty bad translation—even Mori Ogai said so) at https://www.youtube.com/watch?v=2-l7ePNtQvY if you like. I defy anyone to make a less useful comment on this post. They used powder in the official english manga translation, if I remember correctly. Thanks for your work! I’ll patiently wait fo the last box to watch the whole show. It’s a part of “Tales of Italy”. Summary: a guy hits his fiancée due to a misunderstanding and then chops his own hand off once we learns the truth. And they lived happily ever after. P.S. Senzamani is supposed to be Italian for “without hands”. Thank you to you and also first comment guy! This is starting to make a bit of sense. I do recall now that Ночью showed up when I was looking into this, but I had no idea how any of these things related because all the titles are different. Familie Ohnehand was one thing, Senzamani (which I now understand is the Italian ‘senza mani’; I just had no idea about this one (Ogai, why didn’t you just translate it into Japanese)) was another, and Ночью still a third, and they all seemed to have different meanings (and I speak none of those three languages), so I wasn’t even sure they were all the same work. Got some literature buffs around here, I see. やるな、comment section. “Carlone Galiardi” (yes, not “Gagliardi,” which is a real Italian name). Always happy to get more atmospheric, post-apocalyptic cuteness. Thanks! Hey, Ep 7 around 06:30 mark, you missed a word. You’re right, I did. It’ll be fixed in batch, whenever that is. Thanks.